Here is a new way to measure how much of this project is funded (courtesy of my friend Amy's creative mind). We took the budget of $55,000 and divided that over 100 children (that is how many children can live at this facility). So far we have enough money to provide a home to 100 out of 100 orphans. 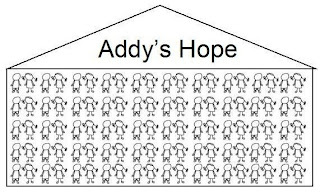 As our project became funded the little stick figure kids turned from gray turn to black, meaning that enough money has come in to provide housing for one more orphan. Praise the Lord! We have enough money to house 100 children! I LOVE IT!!!! Each one of those means a REAL child!!!! !